I am always in search of new seating designs that are innovative and well designed. This chair falls into another category– definitely eye-catching, possibly a stress reliever? 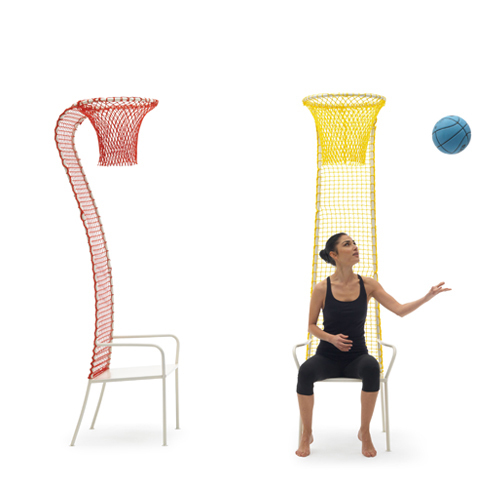 The Lazy Basketball chair puts an obvious whimsical twist on two things, seating design and basketball. This unusual chair, manufactured in Italy by Campeggi and designed by Emanuele Magini, will amuse more than basketball fans. Consisting of a metal framework wrapped with synthetic net and topped off with an unexpected basketball hoop! Take a few moments to watch a slow motion demonstration on the Campeggi website—- click on the text “seat with basket”.